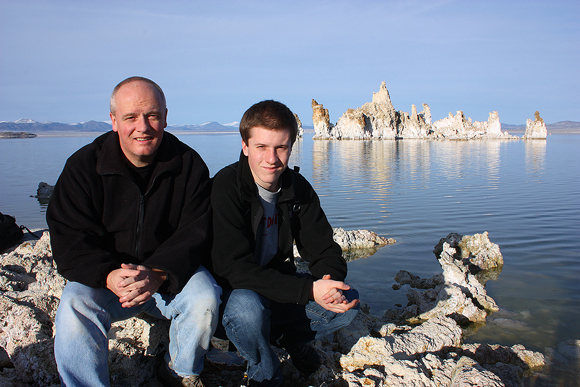 Staying in Lee Vining gave us the opportunity to visit Mono Lake. We were lucky with the light on the first evening we visited, but things didn’t really come together when we returned last night. The afternoon thunderstorms that brew over the Sierras didn’t quite cooperate with their timing, and we were left skunked with rain instead. 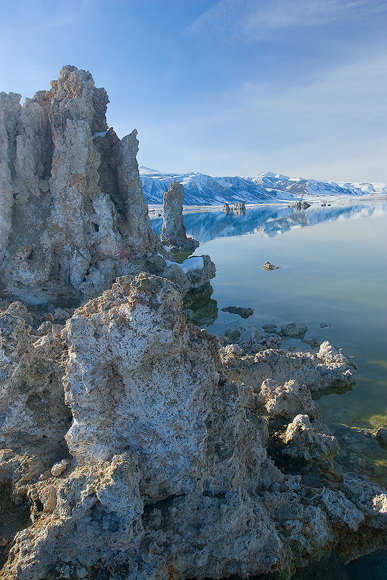 Mono Lake is a fascinating place, and as with much of this area, we would love to have had more time to explore. As we head down into the zoo of people in Yosemite Valley we will be out of contact with the blog for a couple of days, so here’s a few more from our time spent at Mono Lake. This is a very often photographed location, but there is still something special about being there in person and trying to make your “own” images of what truly is a special place. It was still raining lightly as we left the Whoa Nellie Deli. However, things looked very promising as the storm moved across Mono Lake and warm light started to stream over the Sierras toward us. The low-angled light made the ground seem as though it were on fire, and the dark and heavy storm clouds served as a perfect backdrop to what was a remarkable scene. It looked like tonight could have the potential to be one of those special sunsets, where the light on the edge of a storm is truly magical, so we hurried down toward the lake hoping that everything would come together. Mono Lake is an ancient salt lake covering 70 square miles that lies in the shadow of some of the major Eastern Sierra peaks. It is renowned for several reasons, including the migratory bird population that visits each year, the beautiful landscape it offers photographers, and probably most famously, the interesting limestone “tufas” that are scattered along the shoreline. As I mentioned in my last post, Sam and I hiked in to Cathedral Lake this morning from Tuolumne Meadow. Apart from the steady climb at the very beginning I found this to be a very manageable hike. The 9,000+ feet of altitude took its toll on me early though, forcing my lungs, heart, and legs to work overtime. After the initial climb and thoughts of how they were going to carry my dead body out of the forest, we settled into a good rhythm and I actually felt fine most of the rest of the way. We crossed freshwater streams, saw large areas of mid-July snowpack, and admired what were often spectacular mountain views. Storms were brewing on the way back home, so we quickened the pace as best we could without sending me into cardiac arrest. We made it back to Tuolumne Meadow and the car just before the thunder, lightning and rains came. First stop when we got off the mountain was to purchase some after-bite stuff that is supposed to stop you from itching… hopefully it works better than the bug repellent! With the weather looking pretty bleak for the rest of the evening, we headed back down through the Tioga Pass to Lee Vining to get some dinner and decide what to do next. After a pizza at the Whoa Nellie Deli – yes, we ate there again – it looked like there might be a chance of the skies clearing and offering some good, stormy light, so we decided to stick close to home for the evening and visit the picturesque and surreal landscape of Mono Lake. * apparently we completely missed that we should probably have visited Upper Cathedral Lake while on this hike… bummer. With access to many desirable locations in Death Valley still restricted because of the impact of the recent wet weather there, Sam and I decided to take a little side trip out of the valley and over to CA 395 and the Eastern Sierra. The sights and sounds from our day were quite something, and here is a brief synopsis. Mono Lake is an ancient salt lake covering 70 square miles that lies in the shadow of some of the major Eastern Sierra peaks. It is renowned for several reasons including the migratory bird population that visits each year, the beautiful landscape it offers photographers, and probably most famously, the limestone “tufas” that are scattered along the shoreline. We arrived at the head of the road that leads to the lake and were immediately in awe of what we saw. We were excited to drive the last mile or so on the unpaved road, only to find that the snow had not been plowed. After a little debate, we both decided that it would be foolish to try to take the rental car down the road, but since we had driven a considerable distance to get here, we were determined not to be denied and decided to park and hike our way in. Not another person was seen or heard as we wandered around the “south tufa” part of the shoreline in search of compositional possibilities for when the “good” light came later. As the afternoon wore on and the sun started to get lower in the sky, we were both startled by what we quickly realized were coyotes howling somewhere in the immediate area. Admittedly spooked a little, we decided to be “brave” and stick it out in hopes that the skies would cooperate and give us some nice light on this amazing landscape. A little nervous for a while, we stuck together and soon went back to focusing on trying to capture the beauty of this unique lake. Maybe we have been spoiled by the good light and spectacular clouds from the last couple of days in Death Valley, but although nice, the evening at Mono Lake didn’t really produce as we had hoped. We did get some nice warm light early in the afternoon, and the deep blue/pink palette after the sun went down was certainly nice. Also, we couldn’t help be disappointed by the amount of high altitude commercial airplanes that constantly flew overhead, leaving behind unsightly and non-photogenic contrails that made composing pleasing images challenging. Included in this post are a couple that I made before we scurried back up the hill through the snow in the quickly waning light – scanning right and left for the coyotes all the while – toward the warmth and comfort of the car.